Join the more than 3,000 professionals who have participated in our training series. 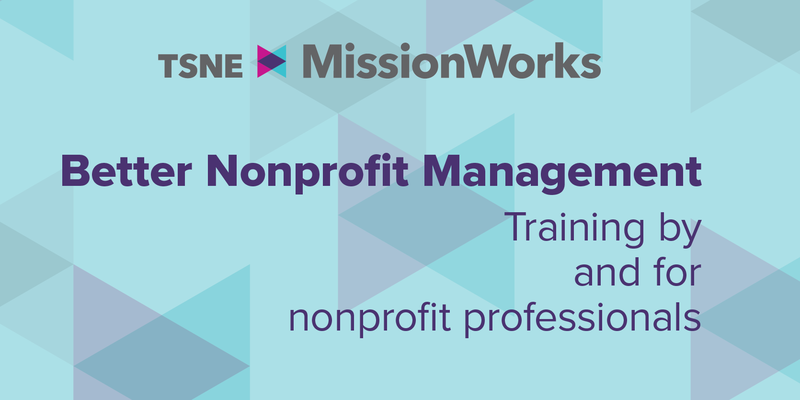 We draw a diverse, dynamic mix of participants from nonprofits and institutions all over the country to our workshops on the issues that matter to managing mission-based organizations. Executive directors, managers, staff, board members and volunteers have attended these in-person, interactive sessions led by recognized experts in their field. Learn more. Community Organizing Center to Support Immigrant Organizing will introduce participants to the process of grassroots community organizing. Participants will learn about strategies and tactics to cultivate the leadership of those impacted by injustice. Roots of Migration: Focus on Central America Presented by the Center to Support Immigrant Organizing, this workshop will focus on the root causes of migration from Central America’s Northern Triangle. Participants will explore the conditions that are uprooting migrants from Guatemala, Honduras and El Salvador and why they are traveling north to Mexico and the United States. Effective Supervision (May) (This workshop is full.) Effective supervision contributes directly to mission effectiveness at your nonprofit. Through this highly participatory training designed for supervisors with all levels of experience, learn how provide strong supervision that builds a culture of mutual respect. Moving Beyond Diversity to Inclusion Nonprofit organizations have worked to diversify their staff and increase representation of people across race, class, gender, sexual orientation, ability, religious and other culturally diverse backgrounds. But how do organizations create an environment where people feel they can actively participate, where their contributions are respected and valued? This workshop is focused on racial diversity and about taking the next step toward moving beyond the individualism of diversity to the systemic and cultural change needed to build inclusive organizations. Innovation Boot Camp: Tools of Design-Thinking For nonprofit professionals who are leading strategic and creative initiatives, the “Innovation Boot Camp” is an all-day workshop that walks participants through a comprehensive design-thinking process. This will be a hands-on, rigorous, fast moving experience, especially designed for the nonprofit sector. [Livestream] Kickstarting Innovation: Exploring the Creative Process Thursday May 23, 2019 9:30 a.m. to 10:15 a.m. Online Lilo Altali Lilo Altali, TSNE MissionWorks' Learning Lab Program Manager, will present this short livestream on why innovation is so difficult and how to use the creative process to kickstart it in your organization. Capital Campaigns 101 and Fundraising for Special Projects Whether you are raising money for a larger capital campaign or a smaller “bite-sized” campaign, it usually takes more preparation than you think. You need to clarify your organization’s strategic needs, recruit board members and key volunteers, engage your donors with your vision of the future, ensure the infrastructure to manage the work, and more. It’s not just a ‘bigger’ appeal, it means supporting a huge effort over an extended period of time. Capital campaigns are a lot of hard work, but they can pay off handsomely. Effective Supervision Part II: A Deeper Dive into Decision Making, Communication and Performance Management Successful supervisors start with curiosity and awareness of their own supervisory and communication style, as well as their particular cultural lens. By expanding their view and skillfully shifting these default approaches, they can more fully develop staff and maximize performance. This highly participatory and reflective training takes a deeper look at concepts discussed in TSNE MissionWorks’ Effective Supervision workshop.